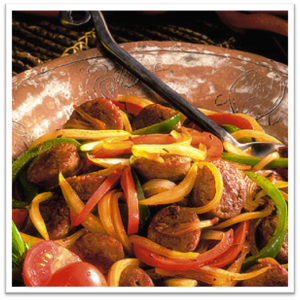 Try this delicious quick recipe made with our Homemade Bratwurst perfect for the Holidays or any other special occasion! Place Bratwursts in large skillet or frying pan with olive oil, cook over medium heat until sausage is browned on all sides. Transfer Bratwursts to a plate. In the same frying pan sauté onions, green peppers, basil, and oregano until onions are golden brown. Add garlic and tomatoes to pan and let simmer for 5-10 minutes. Add Sherry to pan and cook over high heat until absorbed. Add Bratwursts and cream to pan and mix well. Serve with green salad and baguette …….Enjoy!